If you are looking for more Eggless Cookies then do check Moon Biscuits, Little Hearts, Wheat Oat Almond Cookies, Snowball Cookies, Wheat Coconut Cookies, Tutti Frutti Cookies and Wheat Cashew Cookies. Combine the butter and powdered sugar in a mixing bowl and whisk until light and creamy. Add the vanilla essence and salt and mix well. 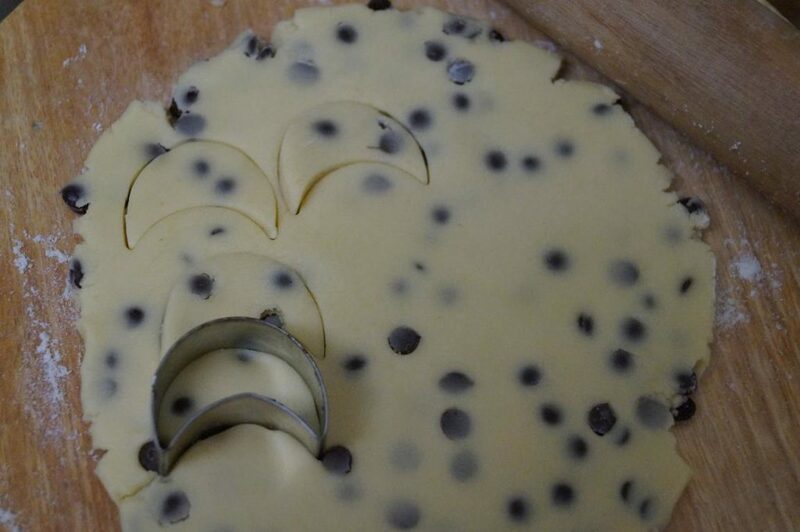 Add the flour and chocolate chips and mix until well combined. Make it into a soft dough. Wrap the dough in a plastic wrap and refrigerate for about 40 – 60 minutes. Line the baking tray with parchment paper and set aside. Dust the work surface with little flour and roll the dough into 1/4 inch thickness. 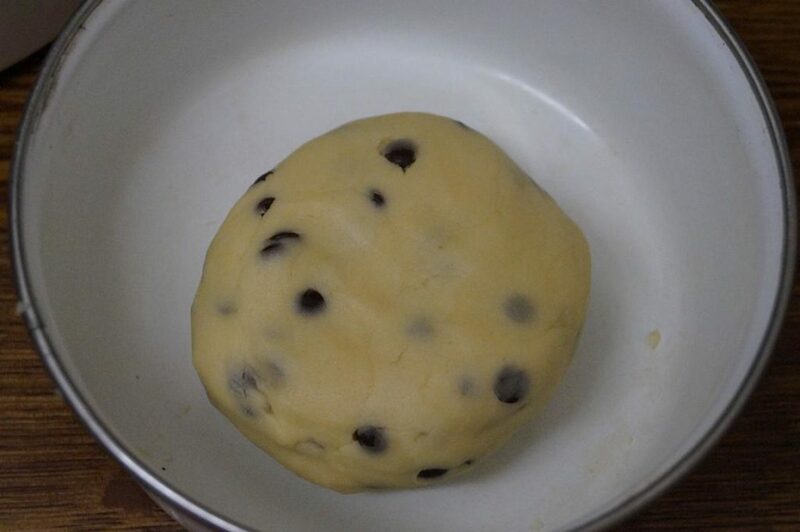 If the dough is very stiff to be rolled, let it sit at room temperature for few minutes. 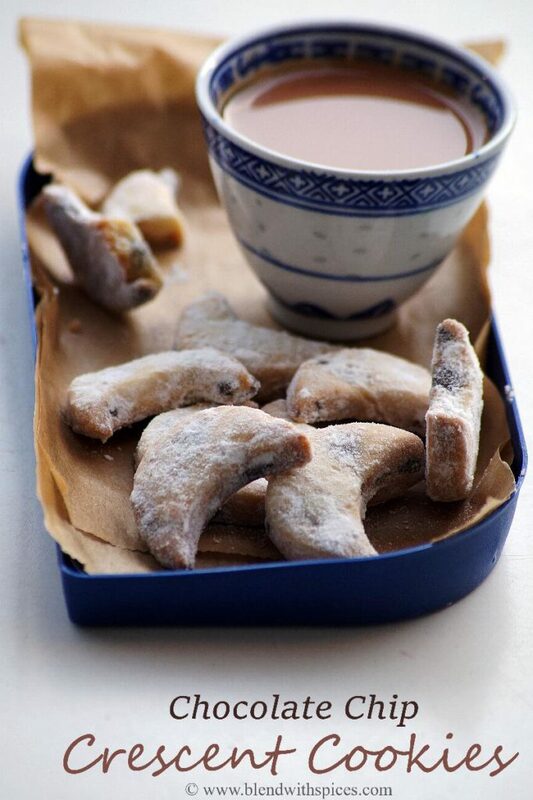 Cut the cookies with a cookie cutter and place them on the prepared baking tray. Bake them in the preheated oven at 180 degree C for about 10 – 15 minutes or until lightly browned on edges. 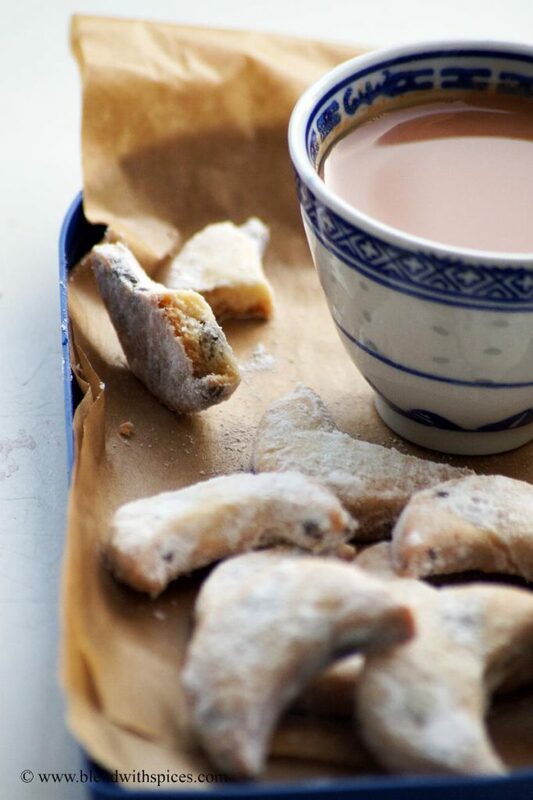 When the cookies are still warm, sprinkle the powdered sugar on the top of the cookies or dip the warm cookies into the sugar powder. Maine aapki recipe try ki par meri ice-cream main crystal aa gaya.. ? kya galti hui? I have made these cookies so many times for friends and family. 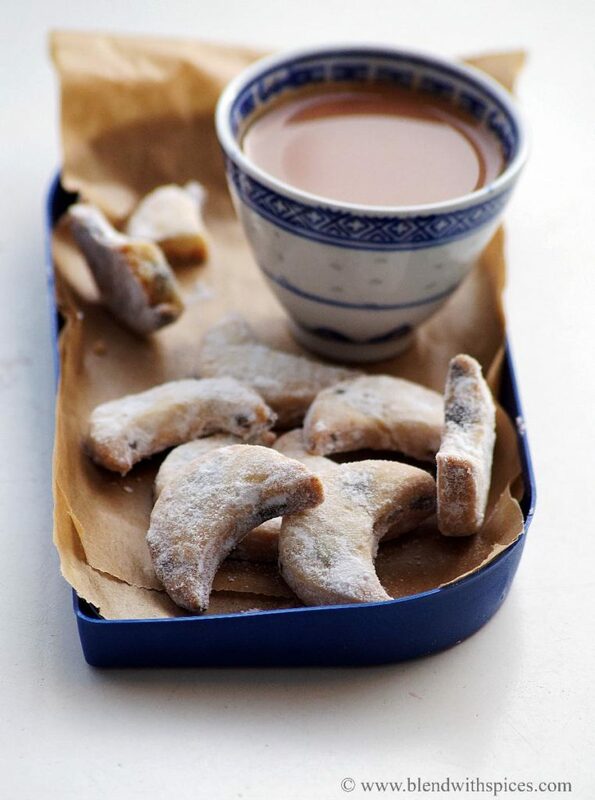 They are so delicious and satisfying, and they are a good complement to tea, masala chai, or coffee. I’ve tried several variations, all with success! Sometimes I use almond or lavender extract. Sometimes I use freshly-ground cardamom or dried currants instead of chocolate chips. 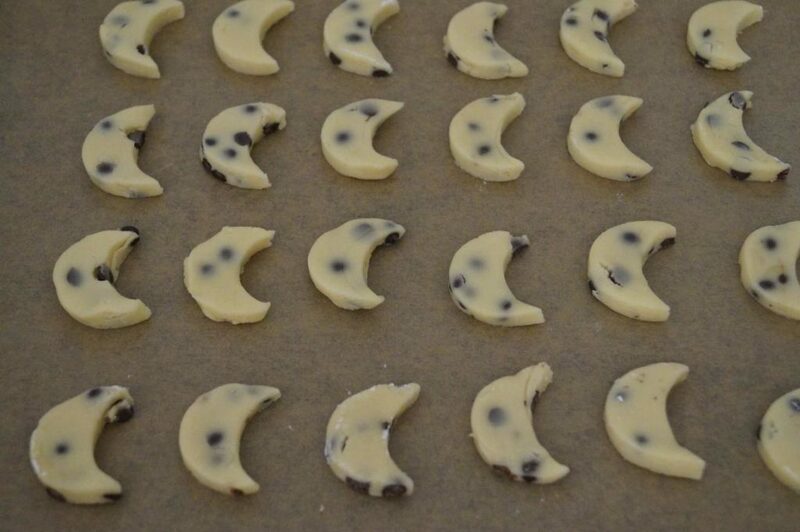 I loved your idea of using a moon-shaped cookie cutter. I cut mine into both crescents and stars. Sometimes I dye the dough blue (for the moons) and yellow (for the stars). This is such a simple, elegant, and versatile recipe. I absolutely love it! Thank you!